I believe babies should be coddled (by the mother). Would you agree? The American Academy of Pediatrics (AAP) used to agree. In 2000, the AAP issued guidelines that children should put off consuming milk until age 1, eggs until 2, and peanuts, shellfish, tree nuts and fish until 3. Delaying consumption of these foods was their method of coddling. In 2008, after seeing no evidence that such delays prevent the development of food allergies, they rescinded these guidelines. Also against coddling are those who believe in the Hygiene Hypothesis. This is the leading hypothesis on the cause of allergies. It says that babies should be exposed to infectious agents and parasites to toughen up. This hypothesis has gained popularity lately because many people believe parents are raising children in wimpier, more sterile conditions and environments than ever before. Furthermore, in just ten years (1997-2007), the prevalence of a food allergy for children has gone up by 18%. Technically, an allergy is an overcompensation of the body’s immune system when confronted with something that the body views as an invader. In the case of food allergies, the immune system stops recognizing certain foods as being “safe” to consume. It is known that an individual can be allergic or intolerant to any food. Food intolerance is a digestive issue rather than an immune response. The following eight foods account for 90% of all food-allergic reactions: milk, eggs, peanuts, tree nuts (e.g. walnut, cashew), fish, shellfish, soy, and wheat. What stood out to me about this list is that these are foods commonly eaten undercooked. I’ve come up with three reasons for this: people buy it “precooked,” a popular cooking method, or it’s difficult to determine when the food is fully cooked. Thus, I hypothesize that food allergy is caused by eating a new food for the first time and it being raw or undercooked. Basically, you introduce a new food to your body and it responds, “Yuck! That was really bitter/astringent/starchy… I’ll make sure you never eat that food ever again.” Similarly, I hypothesize that a food intolerance is caused by constantly eating a food in its raw or undercooked form. So, it differs from my hypothesis for a food allergy in that it’s not being tried for the first time ever, but it is (now) consistently eaten raw or undercooked. You probably have some counterarguments already but I’d like to go through the list of 8 first. In America, milk and eggs are always pasteurized. This means they’ve been heated just enough to reduce the number of pathogens to lower the chance of causing disease—flash-cooked and then refrigerated. I don’t think this is sufficient. I believe milk and eggs must be cooked more thoroughly (e.g. UHT) to prevent the development an allergy or intolerance. I believe the same thing is happening with nuts processed in America. Walnuts, cashews, almonds, peanuts (including peanut butter), etc. are roasted. Roasting is not a fool-proof cooking method and can leave the inner core of nuts slightly raw. In my opinion, a better way to fully cook nuts would be to boil them. In fact, many studies now recognize boiled peanuts as being less likely to cause an allergic reaction to develop than roasted peanuts. The rest of the foods on the list are ones that are sometimes undercooked at home or at restaurants. For example, people aren’t good at determining when the flesh of fish is fully cooked because it’s hard to tell the difference between opaque white and translucent white. This is also the case with shrimp and lobster. As for soy, I presume the leading manufacturers of soymilk are undercooking their soybeans. Lastly, wheat is often eaten raw in the form of cookie dough flour. It’s also eaten undercooked all the time: intentionally with soft-baked cookies and accidentally with pizza. Okay, now your counterarguments: “So why isn’t everyone allergic to fruits? We eat those raw.” The ripening process, to me, is the same as slow-cooking. Thus, the fruits we eat have essentially been slow-cooked and are ripe. If you were to constantly eat a fruit unripe, though—as my hypothesis goes—you will develop an intolerance to that fruit. For example, eat one green banana for 20 days in a row and you should develop a banana intolerance. So from that point on, you should get a stomach ache from eating green bananas and possibly even from perfectly ripe bananas. “So why isn’t everyone allergic to vegetables? Those are raw.” I realize this sounds like a cop-out, but I believe food allergies and intolerances only develop from substantial, calorie-laden foods. This belief is on the grounds that greater action begets greater consequence. I believe 1-calorie lettuce leaves or bean sprouts are inconsequential to the immune system and stomach. “What about a mother’s breast milk? Are you saying moms should boil their own breast milk?” No, I’m not saying that because even I think that would be ridiculous. I must admit, though, this seems like an exception to my hypothesis. “How do you explain the recent rise in food allergies?” I attribute the recent rise to the recent trend to eat raw foods. The reasoning behind this is that it’s natural for humans to eat food raw and therefore best for humans. I disagree with this and actually believe the opposite: it’s human nature to cook everything we eat, and thus the cooked form is optimal for humans. I believe harnessing fire and using cooking utensils are part of being (a well-functioning) human. Recently, the prevalence of gluten (i.e. the protein in wheat) sensitivity/intolerance has risen. I attribute this to the trend of pizzas with toppings overload (for visual presentation and “wow factor”). 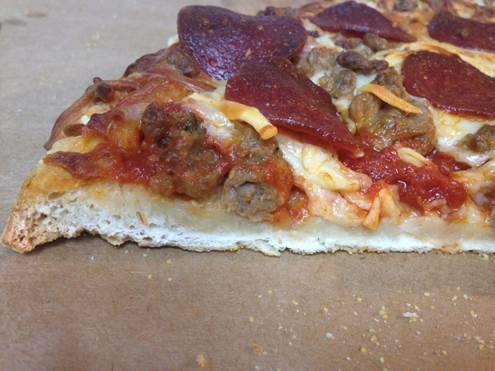 The downside to this is that the dough that’s underneath the toppings is left undercooked or raw. Eating cookie dough raw and undercooked, a.k.a. “soft-baked,” is also very popular these days. I attribute lactose (i.e. the sugar in milk) intolerance to frequently consuming undercooked milk, cream, and cheese. I believe the USPHS/FDA needs to raise its cooking requirement for milk. In conclusion, coddling babies is the way to go. The AAP just got the method wrong; delaying the introduction of peanuts is not effective coddling. To me, coddling is introducing new things still but first removing their harshness. For food, this means cooking it to eliminate the astringency, bitterness, starchiness, etc. My hypothesis is probably true for all allergies. A baby’s first encounters must be passed through a “de-harshening filter.” If a baby is playing with a dog for the first time then you better make sure it’s not be shaking off dander everywhere, otherwise the baby would develop an allergy to dogs.